Yippee-Ki-Yay, We’ve Got DIE HARD 30th Anniversary Movie Tickets to Give Away! Congratulations to our winners! Robert Y. of Torrance, Calif.; Roger F. of Orlando, Fla.; Jim S. of Shadow Hills, Calif.; Andy G. of Plano, Texas; and Eff D. from Cincinnati, Ohio! Now, check out our next giveaway! Is Die Hard the most action-packed Christmas movie ever made? Or the best summertime blockbuster set during Christmas? 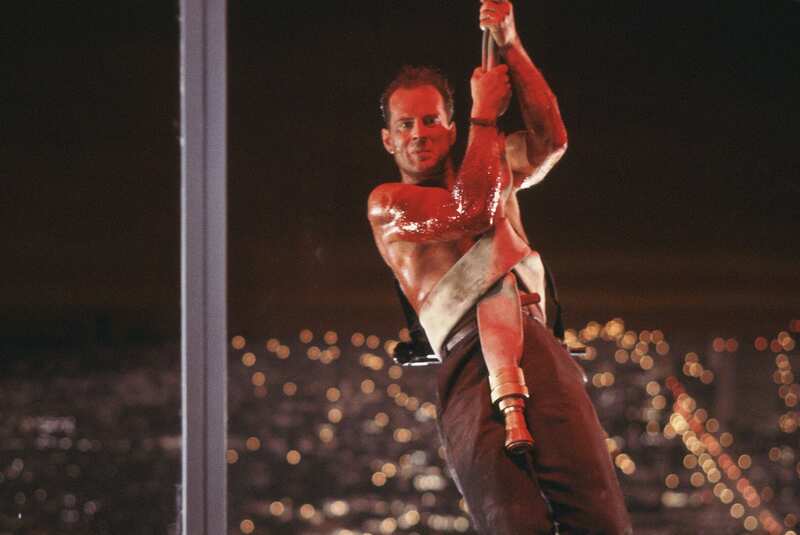 We’ve had 30 years to decide, but really, no debate should be final until you see the first cinematic adventure of John McClane (Bruce Willis) swing into Nakatomi Plaza on the big screen. And, ’80s Movie Guide is here to help! On Sunday, Nov. 11, and Tuesday, Nov. 14, Fathom Events and Turner Classic Movies present Die Hard as part of the TCM Big Screen Classics Series on more than 700 screens nationwide. TCM host Ben Mankiewicz will provide brand new commentary before and after the film to add perspective and insight. Then, you can move on to a new debate: is Hans Gruber the most real life frightening movie villain of all time? We are giving away 5 pairs of tickets to the screening and location of your choice!! To enter to win, just interact with our social media @80sMovieGuide. You get an entry for every interaction, for example: Follow us (1 entry) and comment (1 entry) on Instagram, Like this Post on Facebook (1 entry), Like Our @80sMoviesGuide page on Facebook, Follow us on Twitter (1 entry), Retweet on Twitter (1 entry)…you get the idea! We will choose our FIVE WINNERS on Nov. 5 – enter now! On both the 11th and 14th, Die Hard will play at 2 p.m. and 7 p.m. Tickets are available now at www.FathomEvents.com or at participating theater box offices. We will update the site with the names of the winners. After you enter, watch for us to reach out to you on the morning of the 6th. If we can’t reach the winner, we will choose another winner. Good luck and Yippee-ki-yay! Get Free Tickets to NIGHT OF THE LIVING DEAD 50th Anniversary Screening! UPDATE: Winners have been picked! Congrats to Jason R., David W., Bradshaw D., David, and Instagram winner Changomania! 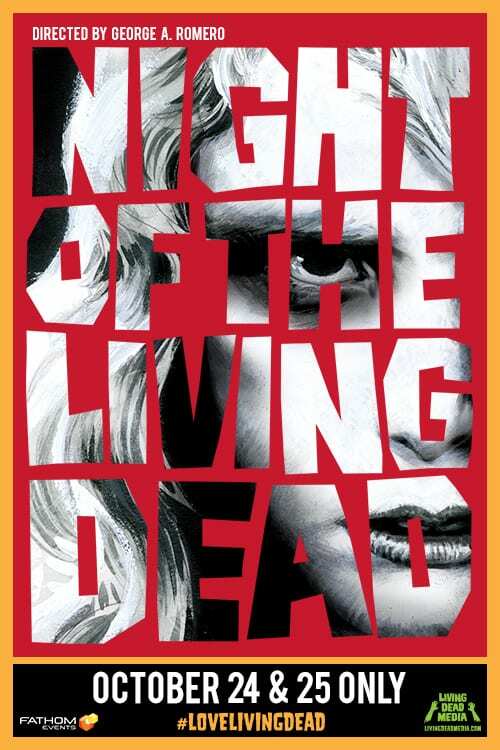 George Romero’s zombie classic Night of the Living Dead is celebrating its 50th Anniversary! Largely considered one of the best horror films ever made, Fathom Events is presenting the newly restored and remastered version in 600 movie theaters with screenings on Tuesday, October 24, and Wednesday, October 25. The Fathom Events presentation also features a new behind-the-scenes look at the making of this groundbreaking film, which ushered in a completely new approach to making horror films. For years, audience have only been able to see Night of the Living Dead in washed-out, murky versions; this is a one-of-a-kind opportunity to see the newly restored version on the big screen. This will likely sell out. But, ’80s Movie Guide is giving away FIVE PAIRS OF TICKETS! All you have to do is FOLLOW and/or LIKE one of our social media accounts (@80sMovieGuide on Instagram, Twitter and Facebook). You get one entry for every action you take – for instance, if you leave a comment, you get an extra entry. If you repost or retweet, you get an extra entry. Just make sure we know you want the tickets! The FIVE winners (two tickets each) will be picked at random on Tuesday, Oct. 16. Winners will then be notified by the social media account they connected with (we will need to get name, email, and your choice of theater and time). Names of the winners will also be listed here in an update. Any unclaimed prizes will go to the entrants who seem like they want the tickets the most through their entries. Entrants/winners can see a full list of participating theaters at this link – just enter a ZIP code to see theaters near you that are playing the film. PS – Night of the Living Dead was released in 1968, but we believe ’80s movie fans share a love for this horror classic! Enter now!